MH17, carrying passengers from Amsterdam to Kuala Lumpur, crashed on Thursday in Ukraine’s Donetsk Region, the scene of intensive battles between Ukrainian troops and local militias defying Kiev’s rule. In the last several days the militias scored a number of successes, including the reported downing of three Ukrainian military aircraft. Despite the violence on the ground and apparent danger to aircraft, the Malaysian airliner was directed to pass right over the warzone and was apparently shot down by a sophisticated anti-aircraft missile fired by a Buk-type launcher. No one has claimed responsibility for the act, which resulted in the largest loss of life in the Ukrainian armed conflict so far. “There are still question to answer like why this plane was flying over that area, whether it was on the correct flight path. It was flying over a war zone where missiles have been fired. It’s a war zone, so why was it flying over there?” blogger and writer Neil Clark asked in an interview with RT. Now airlines and regulators are declaring Ukraine a no-go zone, but before the tragedy the route over Donetsk Region was considered safe for civil aviation despite the violence on the ground. Last week Ukraine closed the airspace in its east to traffic flying at altitudes of 7,900 meters or lower, but MH17 was flying at 10,600 meters. Militias have been using relatively simple anti-aircraft weapons like shoulder-fired SAMs, which can engage targets up to 3,500 meters high, which apparently was good enough reason for airlines and Ukrainian traffic controllers to allow high-flying planes over the restricted area. “MAS had used this route for years and it had always been safe. Fifteen out of 16 Asean Pacific airlines and even some airlines from Europe fly that route,” Malaysian Transport Minister Datuk Seri Liow Tiong Lai said at a media conference on Friday. “There were no last minute instructions to change the flight path to a different route." The carriers had good reason to fly over Ukraine, because it’s the shortest route between many European countries and large cities in Southeast Asia. Shorter fly paths means less fuel spent and larger profits from the airlines. Hundreds of flights passed Ukraine daily before the conflict there escalated, and the traffic remained quite intensive before Thursday’s tragedy. 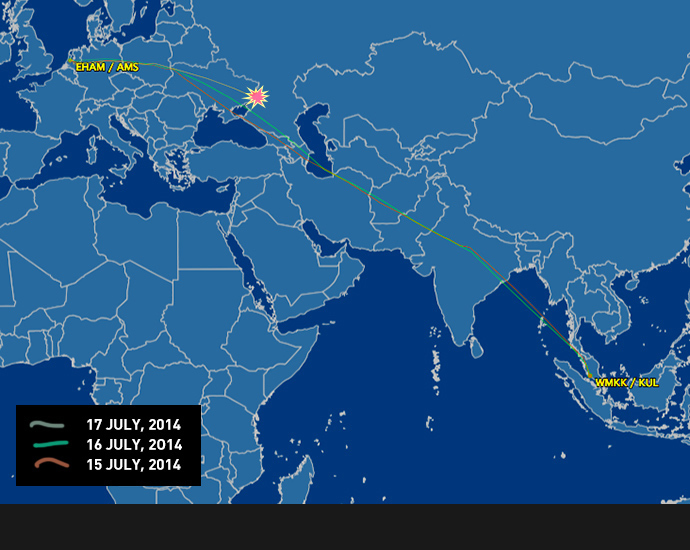 What’s peculiar about MH17 is that the ill-fated flight was different from its usual path over Ukraine. According to data at flightaware.com, a website tracking civil aviation traffic, the flight on Thursday diverted about 200km north from the paths the Malaysian Airlines Boeing 777 had used in previous days. And it led the plane right over the war-torn Donetsk Region. So far no official explanation has been given as to the unusual flight path. But a conflict between Russia and Ukraine over the airspace above Crimea may have played a role. The International Civil Aviation Organization (ICAN), a UN watchdog, considers the airspace over the region part of Ukraine’s national traffic control responsibility. Russia has contested this ever since the former Ukrainian region became part of Russia. Amid the conflict most carriers avoid flying through Crimean airspace. Malaysian Airlines is no exception, and MH17 flights were usually routed over the Azov Sea northeast of Crimea or over the Black Sea to the south of it. If flying over the Azov Sea was not available for some reason on Thursday, the carrier could have been advised by Ukrainian traffic control to divert the flight further north.